Andrei Sviridenko taught modern telephones to transmit voice and show video; now he is focusing his attention on cell phone operators hoping to offset losses from the shift of traffic toward free providers. The meeting with Andrei Sviridenko at Apple’s California office was attended by two not-very-friendly looking vice presidents and a dozen engineers. The company was preparing to launch its first iPhone, but the basic technology – voice and music processing – performed erratically. When a British developer failed to fulfill the technical request, Apple was advised to turn to the Russians. “It was a rush from day one. The project was to be completed in half the time in total secrecy. Money was not an issue,” said Sviridenko. If laughter prolongs life, the 44-year-old owner of Moscow-based software firm Spirit DSP is guaranteed longevity. His laughter is frequent and contagious as he remembers both his triumphs and defeats. 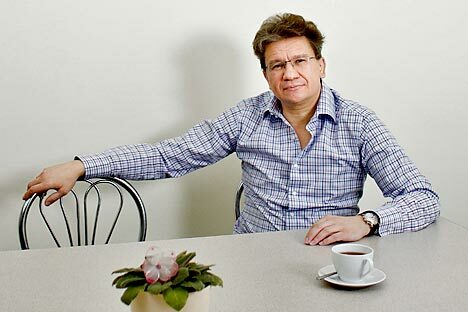 Andrei Sviridenko can be proud that his direct clients today produce more than 60% of all smart phones in the world. However, the pre-installed software market is becoming ever more competitive. So, in 2011 Sviridenko had to come out of the shadow of major producers and finally create a product aimed at end users: VideoMost, a multi-user Web videoconference service. Like IKEA founder Ingvar Kamprad, who got his start delivering matches and pencils by bike as a child, Sviridenko’s business also started with bike rides. With a classmate in Moscow State University’s Faculty of Computational Mathematics and Cybernetics, he developed an artificial intelligence program that could make a medical diagnosis based on a patient’s answers to a structured questionnaire. When Sviridenko went to Heidelberg, Germany as an exchange student in 1990, he visited local computer firms by bike to tout his software. Sviridenko’s efforts paid off: One German company bought a license from Sviridenko and his partner for 10 copies of the product for the then-staggering sum of $10,000. In 1992, the former students registered the company, Spirit, set up an office in a rented apartment and hired a dozen of their classmates at a salary of $30 a month to make the second version of the program. Sviridenko was no longer programming; now, he was writing the product requirements. When they filled a 96-page notebook and it became clear that the team had enough work for the next 10 years, he suddenly felt bored. And so he went to Japan, where one of his university classmates was doing an internship and agreed to represent Spirit. Although Sviridenko failed to sell Spirit’s artificial intelligence product to the Japanese, NEC Corporation offered to develop navigation software for it, including a satellite GPS receiver, vocoder and modem. According to Sviridenko, at the time NEC was what Apple is today – “the world’s largest chip producer and innovator.” The Japanese innovators were not deterred by a visit to the developer’s modest office in Moscow. “They looked at our single room and said, ‘OK, we trust you,’’ Sviridenko said. It was through this negotiation with NEC – and the resulting $500,000 contract – that Sviridenko realized it was time to dump artificial intelligence. Sviridenko bought out his partner’s stake in Spirit and recruited a new team of programmers who were savvy in communications and navigation. However, after three months the project’s chief engineer, a professor and international luminary, declared that he was leaving for Germany to work for Siemens, taking two key employees with him. This might have been the end of the cooperation between Spirit and NEC if Sviridenko had not called his father, also a professor and a luminary in the IT communications field, and asked him if he could recommend some specialists. Surprisingly, the elder Sviridenko joined the project himself. Spirit completed the order, although two months past the deadline. After doing three projects for NEC, relations with Japanese companies became easier. In 1997, Spirit started developing “computer vision” for Toshiba videogame consoles, and communication and navigation software for Japan Radio Company, Iwatsu, Furuno and others. But in 1998, Japan was struck by an economic crisis and Spirit’s business there shrank in just six months: today it accounts for less than 5 percent of the company’s profits. But Sviridenko did not waste any time looking for new clients. Using his contacts in Japan, he started to visit international IT exhibitions. At Spirit DSP’s new office in Moscow, there are several clocks showing the time in different cities around the world and a map studded with flags of various colors, indicating partners and clients. The tactic eventually yielded results: Spirit’s first deals in the United States was struck in 2002 with the companies Agere and Texas Instruments. In 2004-2005, Spirit signed contracts with such giants as Oracle, Adobe and Microsoft. “By that time our communications product had matured enough to tackle the engine problem,” Sviridenko said. Video telephony became a hot topic in the mid-2000s. But Oracle and Adobe stipulated to Spirit that they would pay for an engine licensing fee only once while Sviridenko wanted to get royalties for millions of devices. His wish dovetailed with the interests of cell phone operators, which had just deployed the costly 3G networks, and phone manufacturers, which had started producing phones with a video call function. The operators guessed that this service would explode the market. In reality, its strength was estimated at 5 percent of subscribers. “The reason is psychological,” Sviridenko said. “A mobile call can reach you anywhere. Not everybody wants to show by video where they are and in what company.” However, Spirit made money because video and voice support was installed in telephones by default, regardless of how many people use it. Spirit video engines are installed in LG and HTC phones and its voice engines in iPhones and Samsungs. Spirit’s software platform supports more than 200 million communication channels in 80 countries, according to Sviridenko. Only software company Global IP Solutions (GIPS) supports more (about 600 million channels). Vendors pay software companies several cents for each phone, according to Eldar Murtazin, a senior analyst with Mobile Research Group. Thus, at an average price of 10 cents, Spirit could earn about $20 million in royalties (the company does not disclose its financial figures). According to SPARK-Interfax, in 2010, Sviridenko’s Spirit Corp Ltd and Spirit-Telecom Ltd earned 55 million rubles ($1.75 million) with a net profit of 3.2 million rubles ($102,000). However, these figures may not include accounts with foreign partners. Now, Spirit is reducing its engine sales to outside producers. “If you have good technology that gives you a competitive edge, why sell it? It’s better to make your own product,” said Sviridenko. The market, however, has its own explanation for why Spirit is withdrawing from the cozy pre-installed software segment. “There was a moment when the big players – Microsoft, Google with the Android – entered the smart phone market unprepared,” said Eldar Murtazin. “It was necessary to get a software solution within a very short period of time, and they made it out of whatever was on hand. But they all planned to make their own perfectly intuitive software.” Google chose an even simpler path: in 2010 it bought GIPS for $68.2 million and a year later opened its technologies to outside programmers. The IT giant’s strategy is to popularize its services and earn money from advertising. Research agency IDC put the price of the global videoconferencing communications market at $2.7 billion in 2011, up 20.5 percent from the year before. According to software company TrueConf, the Russian market is worth $80 million and is growing by about 25 percent per year. The bulk of markets – both in Russia and globally – is controlled by Cisco and Polycom. Spirit’s Rolls Royce is a lot more modest. To get VideoMost running, an ordinary computer with a webcam or a tablet would suffice. If the service is integrated with a corporate system, the staff will be able not only to see each other, but to view documents together. TrueConf has a different monetization principle than VideoMost because it is a vendor and not a service provider. In other words, the company earns by spreading its product. For example, a license for an organization of 150 users costs about 1.6 million rubles ($51,000). Thereafter the service is free. Spirit, in contrast, charges not for implementation, but a subscription fee of $20 a month per workplace connected to the server. “The price is justified, but when will the project break even? There are still not many video service clients in Russia,” said Dmitry Odintsov, TrueConf’s development and sales director. People prefer numerous free video services, the most famous of which are Skype and Google Video. Travel agency Natalie Tours tried to use VideoMost but, according to development director Gennady Gurchenok, it fell back on Skype, which turned out to be cheaper and easier to use. However, Skype’s simplicity borders on minimalism. For example, it doesn’t even have telephone service technical support. Skype and Google, Sviridenko notes, are aimed above all at individuals, whereas serious corporate clients are more likely to opt for paid administered service from a reliable provider to whom claims can be presented if anything goes wrong. Spirit, incidentally, is not this kind of provider in the eyes of serious clients. “We are a small software company,” Sviridenko said. He plans to promote VideoMost primarily through phone operators whose revenues are sagging due to free VoIP providers and who are interested in new paid services. Spirit has already signed contracts with Rostelecom, Kazakhtelecom and several other operators. Sviridenko does not disclose how many licenses he has managed to sell, but he expects that by the end of 2012, a million paying subscribers will be using VideoMost. For comparison, TrueConf has installed its videoconference equipment at 9,000 workplaces. “Getting a million subscribers is only possible if you create a single state service and force all the government agencies to use it,” said Odintsov. “A Russian Skype is the dream of many officials and operators, but it can only be introduced by using a big stick.” Of course, the “stick” method of doing business is popular in Russia. The big question is whether the owner of a small software company will be allowed to use that stick. First published in the Sekret Firmy magazine.